Chanteuse Country US née le 17 Mars 1952 à Las Vegas (Nevada). 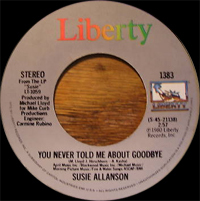 Singer and actress Susie Allanson did not have a "classic country" voice — she possessed a girlish, almost whispery quality with theatrical intonations. The latter was not surprising, as she began her professional career in the road version of Hair in 1970, also touring with Jesus Christ Superstar a year later. She stayed on for 18 months, singing on the U.S. cast album and appearing in the film. 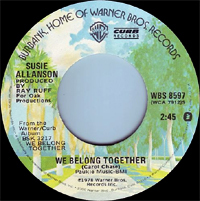 Allanson moved to Southern California in 1975 to audition for a bicentennial project by Ray Ruff, who later became her husband and manager. ABC released her debut album, which contained the single "Love Is a Satisfied Woman"/"Me & Charlie Brown." Allanson released another single, "Baby Don't Keep Me Hangin' On," which led to a deal with Curb Records. They took over the single, which made it to the Top 30. Her next album, We Belong Together, contained two hits, the title track and her cover of Buddy Holly's "Maybe Baby," which reached number two and four respectively on the charts. In 1979, she signed to the Elektra label and released the album Heart to Heart, which contained two major hits, "Words" and "Two Steps Forward and Three Steps Back." 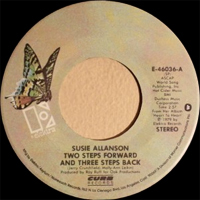 In 1980, Allanson moved to United Artists/Liberty for Susie, which contained only two minor hits. It was the last Allanson LP issued. Her 1981 singles — "Run to Her" (a cover of Bobby Vinton's "Run to Him") and "Love Is Knockin' at My Door" — both hit the Top 50, but the album upon which they appeared, Sleepless Nights, was never released. 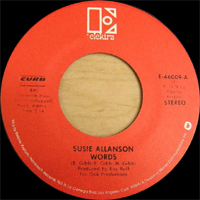 Allanson settled into motherhood during the 1980s, but did release the singles "Where's the Fire"/"Can't Say It on the Radio" and "She Don't Love You"/"Girls Get Lonely Too" in 1987 on the Los Angeles indie TNP. 1979 SP ELEKTRA / CURB 46009 (US) . Words / ?